Mozilla has just released a new version of Firefox stable, bringing the version of the browser to 13.0.1 for all supported operating systems. 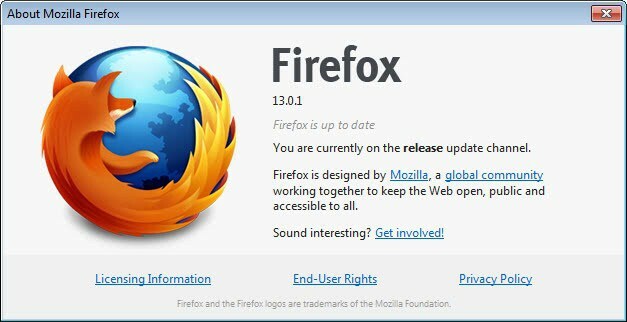 The release notes list both the changes that Mozilla made in Firefox 13 and the three bug fixes in the Firefox 13.0.1 release, which had been released two weeks earlier. If you have been using Firefox recently you may have noticed that a Flash upgrade has caused serious crash and freezing issues for some users, which the new version unfortunately does not address completely. When you look at the bug fixes, you will notice that one addresses a Flash 11.3 issue. According to the fix, Flash 11.3 sometimes caused the web browser to crash on exit. This fix obviously does not address other issues that Firefox users may experience with Flash 11.3 installed in the browser. Both Mozilla and Adobe seem to still be working on fixes for the issues that have been caused by the Adobe Flash 11.3 upgrade. For now, Firefox users can use workarounds which we have posted in the article linked above. The second bug fix addresses issues in Hotmail, where Firefox did not auto-update the service's inbox, did not update the unread email count in the title bar, and where Windows Messenger did not load anymore. The issue has been fixed by Mozilla, and Hotmail users should be able to make use of the site's functionality again. The third and final bug fix addresses an issue for Hebrew users who noticed that text got rendered incorrectly at times. Firefox 13.0.1 is already available for download at the official Mozilla website. Existing Firefox users should see update notifications in the browser once they start it up the next time. It is recommended to update as soon as possible, especially if Firefox is affected by any of the three bugs. Having problems with Firefox 13.0.1, when i click a link – nothing happens, i have to reload the page sometimes! I experience the same problem. Clicking on a link brings nothing. Reloading brings nothing. And disabling all add-ons does nothing. When oh when oh when will someone write an authoring application that allows developers to do what they can in Flash, in HTML5/canvas/JS/SVG/CSS etc? Then we can finally get rid of Flash and essentially therefore get rid of plugins. All disabled I suppose? I have long since criticized companies like Mozilla or Google for not providing users with a choice when it comes to the installation or integration of plugins in the browser. How hard can it be to block the plugins by default, or display a prompt to the user before plugins are activated. No, they are all enabled. They don’t seem to be breaking anything. I do wish users would be allowed to uninstall plugin’s. Latest Firefox will not let me play youtube etc . I’m sure it’s an add on issue but I don’t know how to solve it. Tried reinstalling it /Flash /Java etc . Still no luck . It is a Flash issue. Firefox 13.01 freezes when I load certain pages, like Gmail when logged in and http://www.cbc.ca/news/. Nothing responds, I have to kill the Firefox process from Task Manager. This doesn’t happen with Chrome or IE. I’m reverting to Version 12 and see if that fixes it. This is on a Win7 32 bit box. I didn’t have a problem one, until updating to 13.0.1. Flash started getting sketchy, I lost the ability to login to some sites, and others just won’t load correctly. The “new tab” bs in 12 bugged me, but I was able to turn it off – the crap in 13 just pisses me off – and they’re trying to blame it on flash… oh puhlease, it worked fine before 13.0.1, updated flash or not. What bugs me the most, is that today, I had to resort to IE of all things, to make a financial transaction – not cool Mozilla. Great Firefox updates to 13.0.1 and now Google Toolbar isn’t working. How hard is it for FireFox developers to integrate probably the most popular toolbar out there? Angry Guy: I think the toolbar decision was Google’s. Google seems to have been shying away from its toolbar (e.g. never a version for Chrome), which is a great shame, “Bookmarks on the cloud” is a great idea (i.e. without sharing with the rest of the world, a la Facebook, blech!). This is very disappointing . Firefox 13.01 just hangs and takes forever to load a page. The only fix that worked for me though was when i disable java scripting all problems went away ? Anyone else experience this ?